The Ponte della Maddalena, also known as Ponte del Diavolo crosses the Serchio River in Provincia di Lucca, Italia. It is alleged that the mason who built the bridge (around 1100 AD) was having great difficulty completing the construction when the Devil appeared to him as a businessman, offering to finish it in return for the soul of the first to cross. The cunning mason heartily agreed, the bridge was completed overnight, and the mason made good on his deal. He sent a pig over the bridge. This did not make for a happy Devil. The roots of my dna are entwined with this bridge. My grandmother Maria Maddalena often crossed this bridge, once presided over by a statue of her namesake saint, which stands no longer. 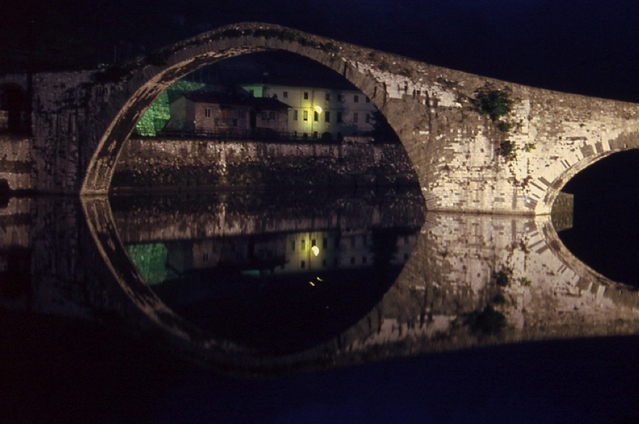 From Borgo a Mozzano she would travel to meet my grandfather, he en route from Sant’Anastasio, and the bridge was their meeting place. When I was little, my grandfather spoke of the Ponte del Diavolo née Maddalena in near reverential tones. Perhaps uncle Caesar and my father were both conceived on this bridge, which would explain how the Devil broke into the Bertei bloodline. Yet this may have occurred a generation before when my grandfather, stevedore Ange thought wings were his birthright. Born in Marseilles of French and Italian blood, Ange worked the docks and married a spitfire of an Italian girl named Archedina Bacci. All that remains of their story is Devil be damned, Ange leapt angelic into the sea and his death, the Phare de Sainte Marie his only witness. Several men on my father’s side of the family emigrated to America when Mussolini came to power. They all found work in Cleveland, which few think of as a City of Bridges yet with 330 bridges in its modest sprawl, thus it is known. There has been no greater interpreter of bridgian lingua franca than the poet, fellow Ohioan Hart Crane. Hart spent many formative years in Cleveland, whose bridges nourished the roots of his greatest work.